Have you started working on your Christmas gift list yet? So far I've shared my Women's Christmas Gift Guide, Kids and Teens Christmas Gift Guide and my Baby and Toddler Christmas Gift Guide and now we're onto the men! Jesse is one of the first people who I buy for each year as I love finding the best gifts to surprise him with. To help you as you decide what to buy for your Dad, Brother, Boyfriend, Husband, Fiance or Friend, I'm sharing some of my favourite Christmas gift ideas for Men this year! Who for? Any classic gamer. The best bits? This tetris lamp allows you to stack the pieces up any way you like to create your lamp. As you connect each piece, the piece will light up as it's connectors touch. Where from? Online at Amazon. Who for? Any Pokemon Go fan. The best bits? Let's be honest.... who doesn't agree with this shirt?! The best bits? This gift set features two different hair and body washes - the Sport version is fresh and invigorating whilst the regular version has amber tones and an oriental inspired scent. Who for? Any man looking to perfect his self care routine. The best bits? This dual blade hair clipper allows you to create a short or faded cut; giving you everything needed for an effortless DIY cut. Who for? Any bearded gentleman in your life. The best bits? This beard trimmer ensures you're not left with a sink full of beard clippings as the vacuum system captures hairs whilst delivering superior trimming performance. Where from? 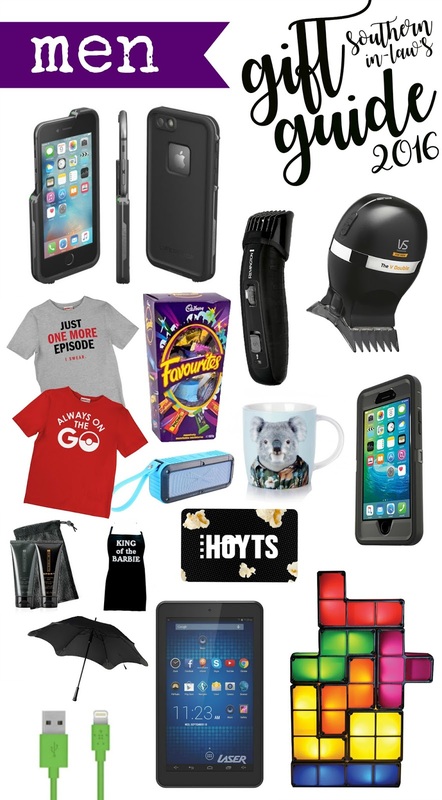 Shaver Shop, Harvey Norman, Target, Myer and Betta Electrical. The best bits? The world's thinnest 2TB mobile hard drive, the Seagate Backup Plus is a must have for any techie. Perfect for saving holiday snaps, important work files or, let's be honest.... gaming files... this is a gift that will certainly be appreciated! Available from: Available at Officeworks, JB HiFi and selected stockists. The best bits? The perfect stocking stuffer, Belkin's cables, are made to be durable and are available in a range of colours, patterns and textures. The Mix It Cables range of cables are available to suit a wide range of phones and devices and prices start at $14.95. Also be sure to check out their docks and car chargers for something a little extra. The best bits? Whether you're heading to the beach, working out in the gym, lazing by the pool or hanging around at home, this speaker is perfect. Splash, dust and shockproof it's designed to allow you to stream audio wirelessly wherever you go! It can also be mounted to your bicycle or camera mount if you want to secure it for use. Where from? Online at Laser. Who for? Any techie on your list! The best bits? Protect your phone with 360° of coverage with LifeProof's incredible cases. Available in a variety of styles and devices, they're perfect for everyone on your list! Who for? Just about any guy on your list! The best bits? The perfect price point and a great gift idea, this tablet is packed with features and 8GB of storage. It's WiFi enabled so you can connect to your network and runs on Android 6 so you can make it your own! Who for? Anyone on your list! The best bits? Let's be honest, OtterBoxes are the only reason Jesse and I have never smashed an iPhone screen. We drop them, we bump them and yet they still stay in one piece. Available for almost every device, OtterBox cases guarantee your devices stay in tact! Who for? The King of the Grill! The best bits? Got a guy in your life who fancies himself as a bit of a grill master? This is the perfect stocking stuffer for him! Where from? Online at Annabel Trends. Who for? Any one with a sense of humour. The best bits? A practical gift and one that will definitely be used, Blunt Umbrellas are designed to be strong and stylish to ensure unpredictable weather never ruins your day. How much? Prices vary with size. Who for? Any chocoholic on your list! Where from? Coles, Woolworths, IGA and most department stores. Who for? Any Stranger Things fan... which is everyone, right? The best bits? No words needed here. If you're a Stranger Things fan you NEED this shirt! Who for? Any Netflix addict or movie buff who loves a good movie night/tv bingeing session at home. The best bits? This is seriously the BEST popcorn maker ever. It's super easy and so much better than those kind of freaky yellow microwave popcorn packs. The best bits? Christmas is in the summer in Australia and we always include some kind of pool/water toy in our Christmas stockings as we're usually heading to the beach or swimming in the pool around that time. This is the perfect fun float for summer! Who for? Any movie lover. The best bits? Treat your loved one to a movie of their choice with a HOYTS Movie Gift Card. You choose the price and the experience and let them choose the movie! Where from? Online at The HOYTS Gift Store. Who for? Any Netflix addict! The best bits? Find yourself wanting to watch just one more episode? You need this shirt for your binge watching sessions. After all, you're a marathoner so you need the gear... right? But tell me, who is the first person you usually buy for at Christmas time? Who's left on your list?